Trade shows might not seem as important these days with so much information available at your fingertips, but nothing compares to seeing and touching the actual products that you’re interested in. ISC West, the security industry’s largest active tradeshow, is this week in Las Vegas and the ASSA ABLOY booth (#8061 if you’re going to be there) will have plenty to show and touch. Threat resistance is a new theme that will be part of the high performing doors display this year at the booth. Two Attack Resistant Door Openings will make up this portion of the display. One will be a wood door that was used in an actual test, and the other will be a new operable metal door with a video display behind the lite kit. The video will show clips from the Attack Resistant test, as well as the Forced Entry Bullet Resistant test as that product also fits under the threat resistance heading. The key feature of the Attack Resistant Door is the glazing and lite kit offering as part of the full assembly. ASSA ABLOY has partnered with School Guard Glass to source this material and provide the factory glazed solution. In addition to the booth at ISC West, live demonstrations of the ASSA ABLOY Attack Resistant Door featuring School Guard Glass will be held at the southwest corner of the exhibit hall, adjacent to booth #34107, at noon pacific time Wednesday, Thursday, and Friday April 5-7th. Attendees are invited to watch a simulated assault and see how the door and glazing react to a concentrated physical attack. Attack Resistant Doors are an ideal solution for schools and other highly populated public buildings as they bridge the gap between standard doors and high level bullet resistant openings. The initial 2017 Govies Awards list presented by Security Today has recently been released, recognizing the Attack Resistant Door as the winner in the Fire and Life-Safety category. This cost-effective solution permits increased protection throughout buildings, either through retrofit of existing infrastructure or in new construction. Doors, frames and hardware are available in various colors and finishes to accommodate many interior and exterior applications. 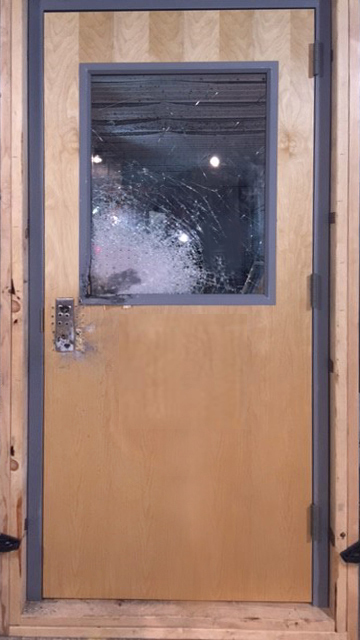 Rounding out the high performing door display back at the booth are blast and bullet resistant, RF shielded, and acoustic openings for high level STC ratings. For more information about these products and the rest of the ASSA ABLOY specialty door line-up, download the Specialty Product Brochure available on the Ceco or Curries websites.